TNPSC will hold the written exam on 02.03.2019 FN & AN for the Direct Recruitment to the posts of Pricipal, Indistrial Training Institute/ Assistant Director of Training Service and Assistant Engineer (Industries) in Tamil Nadu Industries Subordinate Service. The Last Date for Submission of Online Application is 24.12.2018. (ii) Practical experience in a workshop or factory for a period of not less than three years. 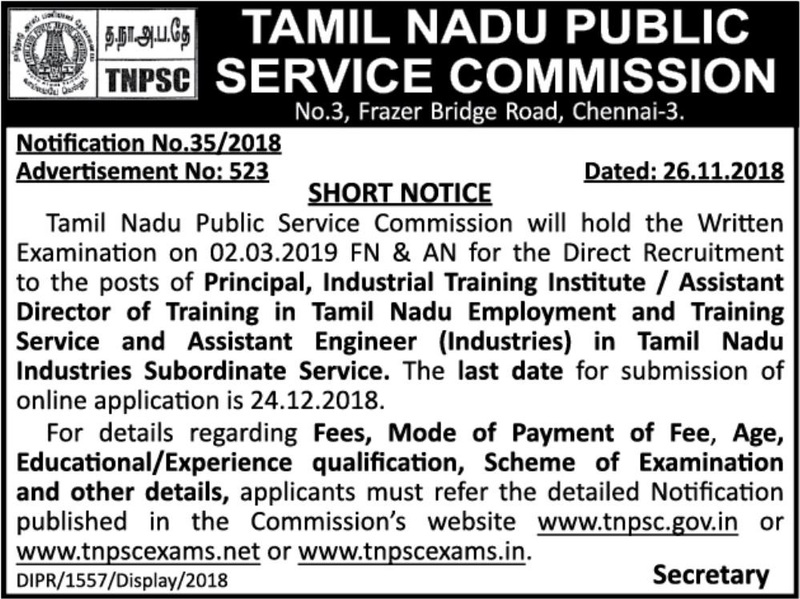 For More details regarding Fees, Mode of Payment of fee, Age limit, Educational Qualification, eligibility, experience, scheme of exams and complete details follow the tnpsc official website.